Khloe Kardashian definitely wants more kids, but she's going to take some time before giving True Thompson a sibling. The Keeping Up With the Kardashians star just welcomed her first child with boyfriend Tristan Thompson back in April, so she's not ready to get pregnant again just yet. But, she told to E! News' Justin Sylvester during a recent interview that she would "love" to have more children in the future. "Let my uterus shrink down again!" Khloe joked when asked if she has baby fever. "I honestly think I would love to have more kids, but I think I just don't know if I'm ready to get pregnant again, it's a lot!" 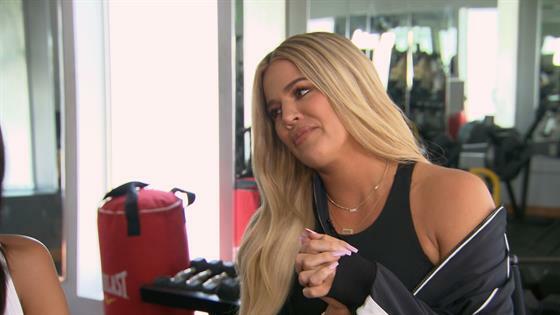 Khloe Kardashian Claps Back at "A--Hole" Mommy Shamers: "It Drives Me Crazy"
"But I definitely want more kids, I just don't know when that is gonna be," Khloe continued. "I heard that you should wait at least a year." Khloe also gave us some insight into True's personality, telling E! News that she's "so sweet" and "so girlie," and sharing that she loves to put bows on her baby girl. "I'm just doing exactly what I hated that my mom did to me, I'm basically doing it to True," Khloe said, explaining that she used to see pictures of herself, Kourtney Kardashian and Kim Kardashian dressed as triplets with "huge metallic bows." "I was like, 'What the f--k?'" Khloe recalled. "And now I'm doing it to her." Khloe and Good American co-founder Emma Grede also shared their advice for moms who are trying to get into shape after having a baby. Take a look at the video above to see what they had to say! The Good American performance line is out now.